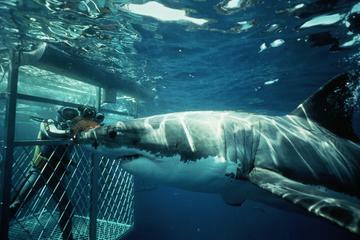 Get up close and personal with the sea’s apex predators in this adrenaline pumping tour that is unforgettable. You are guaranteed to get face to face with this incredible creatures and experience their strength first-hand. The 10-hour program starts off with a transfer from your Cape Town hotel or accommodation to Gansbaai. The 160-kilometer drive will take you past picturesque scenery with mountains on one side and the sea on the other. Your dive will take place near Dyer Island, just off the coast of Gansbaai. Dyer Island is home to the largest seal colony in Southern Africa, with about 60 000 seals settling there. This is also the main food source for the sharks. 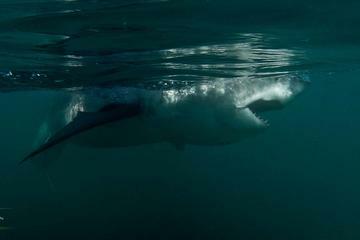 The channel between Dyer and Gansbaai is called Shark Alley, is this is where the diving will happen. The sharks are surface feeders, therefore this is a surface dive, meaning no scuba certifications are needed. This package includes transfers to and from Gansbaai to your hotel or accommodation, breakfast, lunch, 3-5 hours at sea, snacks on the boat, use of all equipment, an 8-man cage, several opportunities to dive, and a guaranteed small group (max. 24 people). This tour is great for anyone. 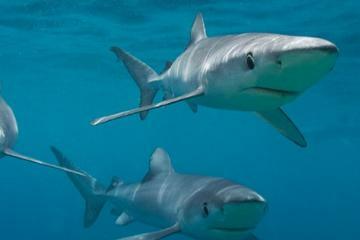 Anyone who wants to learn more about sharks, has a love for them, is an adrenaline junkie or someone looking for a once-in-a-lifetime experience. 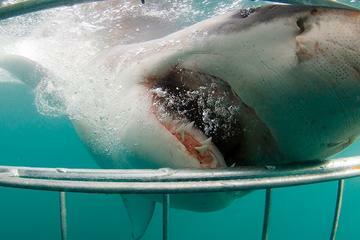 Excellent chance to see endangered beautiful white sharks. Very nice tour and a chance to learn about these magnificent endangered creatures. Travel time by car from Cape town takes about 2 hours, so it's a long drive, but worth it. Best Adrenaline Experience! Marine Dynamics staff are a profesional and sustainable company providing this adventure . 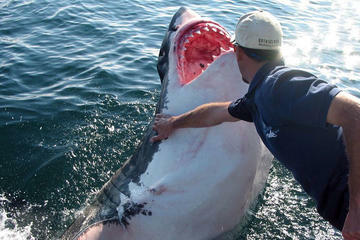 The formality and their expertise in White Sharks made the day unforgettable . The experience was great. But it was nowhere written, that the drive takes 2,5 houres. I would have apreciate that. The crew did a awdome job! toller Ausflug Wir wurden pünktlich abgeholt und hatten eine Fahrt durch herrliche Landschaft. Am Boot angekommen, hat es sehr stark geschaukelt und die Hälfte der Leute wurde seekrank. Gesehen haben wir vier Haie, allerdings nicht den weißen Hai. Toll war, dass wir nach zu Hause eine Email von alleine bekamen, dass wir wegen schlechter Haisicht Geld erstatten bekommen. Der Ausflug hat sich sehr gelohnt, auch wenn wir persönlich nicht im Käfig waren, da man wegen schlechter Sicht vom Boot aus besser gesehen hat. Als kleine Anregung würde ich geben, dass es besser vor der Tour kein Essen geben sollte, sondern besser danach. Das ganze Essen hat die Leute noch stärker mit Seekrankheit belastet. Wir selber sind extra nüchtern geblieben und das war auch gut so! Insgesamt ein fantastischer Ausflug, den wir jedem empfehlen würden. Sadly, a waste of a day, driving, sitting, waiting. Our driver with African Eagle tours was great. He was punctual and told us about the country as we drove to our destination. The company that took us out, Shark Lady, was two hours late, with munimal explanation as to what was going on in that time. When we finally got on the boat nobody even got in the wetsuits nor the water. The guides didn't interact at all with us or make an effort to make the experience worth it despite there being no sharks. After an hour of waiting we went back where we were told we could get vouchers from the lady. She wasn't there. And we had to get back in the vans. I got home at 10 after having left that morning at 10:30. A frustrating waste of a day. Super Crew, tolles Boot Super nette Crew, tolles Boot und sehr guter Käfig. Leider haben wir keine Haie gesehen, würden dort aber auf alle Fälle wieder hin. Massen Anfertigung Haie werden angefüttert und die Leute steigen in den Käfig und warten bis ein Hai vorbei kommt. Die Beobachtung ist okay nur der Umgang mit den Tieren nicht. Sie werden nur heiß gemacht und bekommen nichts von dem Futter ab. Das Boot ist zu klein und zum umziehen nicht viel Platz. Preis Leistung passt nicht. A very expensive disappointment I feel like I was taken advantage of. I looked into cage diving and I read the reviews, I even spoke with a local gentleman about the best day to go while I was in South Africa. When I arrived to the shark cage diving facility the instructor told our group that they had seen less sharks in the last year than any other AND that they had not seen a shark in 19 days. If I had known this, I would not have spent all that money on this adventure. The website or the company should let us know how many sightings there have been, or warn us that we will very well see NO sharks (or any animals). They gave me a voucher, but I am leaving the country. I don't know when I will return. The least they could have done would have been to let us get into a wet suit and get pictures in the cage or visit the seal island! We sat on the boat for an hour not talking much and not doing anything. I am extremely disappointed and think that money should have been returned back to us. Not much to see, no excitement at all, people did not seem to like their jobs. Once in a lifetime experience! My youngest, who is 9, also loved the experience!!! 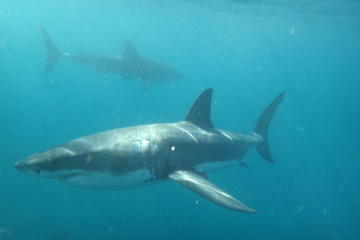 This was horrible- long and far from Cape Town, poor communication, and no one told us that the Great White are no longer coming around the waters they cruise. 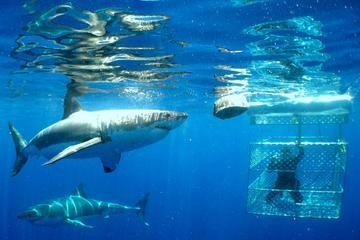 They did not even put the cage in the water and only 2 sharks came and went. NOT worth the money or the time. The only saving grace was the scenery down to the dock. 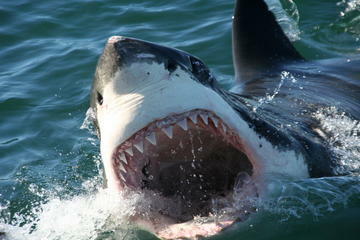 No Sharks in Gansbaai at the moment due to Orcas so was asked if I minded going to Mossell Bay which is further. Well worth the trip where we saw 7 great whites! The views on the drive were spectacular and Jacob the guide was brilliant. We really enjoyed the day, Alain is a great driver a guide a did an exceptional job of making us happy, very well done! To see sharks in their natural environment. Luck of the draw. Changing into wet suits on a rocking boat and in the open is not ok for everyone. Preference would be to suit up before boarding. Crew were great. The Disadvantages: First of all the displayed photo along with the tour is totally a fake. The water clarity is too bad, you will not see more than 2m ahead. The cage is not for one person, it is for group of people together we were 6. Secondly, it is not a scuba diving, the scenario is the cage will be close to the boat and part of it above the water surface, when the shark come close to the boat, someone will shout, so you will take a deep breath and free dive under water to have a quick look on the shark if it is close enough to you remember the water clarity is too bad. Thirdly, the boat is not that luxury, I believe it is a fishing boat. 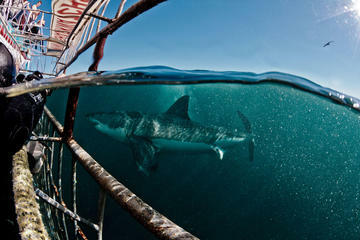 The Advantages: You would see obviously the shark while you stand on the boat, since it comes to the surface of water around the boat. Eventually, my advise is, if it is the first time for you to see the white shark, yes go ahead, otherwise, I do not advise you to take it.